Oh, editing. What can I say? This is such a fundamental part of the writing cycle, and yet, it never seems to be that important when you’re not doing it. I have been editing a LOT in the last few months, working on different projects in different stages of editing. But it doesn’t change the fact that I never realize just how vital editing is until I actually start it. I know it’s important, and I would NEVER think of not doing it. But once a work has been edited, and then it’s sat untouched for awhile, and I decide to go back over it again, I am always shocked by how much I still find that needs changing, tweaking, massaging, or even just admiring. 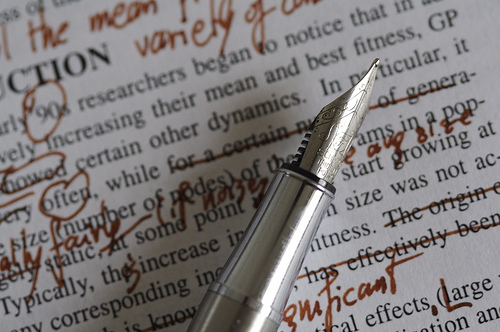 A lot of writers hate editing, and some writers love it. I feel both emotions regularly while editing. When I get stuck, and I feel like I’m drowning in one sentence that I cannot get right but that I cannot leave without first getting right, editing is ridiculous. An hour on a paragraph? Oh yes, I’ve done it. And sometimes that hour is totally worth it. Sometimes, it’s not. But then you hit a spot where you find mistakes or oversights that can so easily be fixed or improved, and you thank the stars you decided to go over the text again. And better yet, you hit those areas that you love, where you fall into the story and become absorbed in the world once again. It’s easy to question every detail of your work when it’s sitting, or it’s being shopped around to agents (and, I’m sure it’s the same when it’s being shopped to editors or publishers, too!) What once seemed perfect begins to take on this weird, shadowy form, monstrous and unnamable. So when you are editing, and you find that area of the story that makes you smile or clutch your desk in worried anticipation, that stings your eyes with tears or gives you a complete, calming wave of satisfaction…that is when editing is amazing. I’m editing right now. About 70% through the story, and I have another project that needs first-round edits once this is finished. But I don’t mind. Editing is hard, but it is important, and necessary, and sometimes wonderful. For all those other editors out there, happy frustrations and may you always find joy within your own pages! I like to have a minimum of two projects in play. One I'm Discovery Drafting, and one I'm editing. That way, I'm less emotionally invested in the bit I'm editing, and I can cut more critically. And then there's this: "May you always find joy within your own pages!" This has to be one of the best writer's blessings I've ever heard. Love it. More importantly, now that's it front and center, I'll try to live it. Great post, Mere! I totally agree. Sometimes I love editing. Sometimes I hate it. I mostly hate it when I'm editing for word count (I have a horrific habit of going over) At that point, it's not just killing my darlings, it's a tedious exercise in frustration. Could this fifteen word sentence be said in ten words? Doing that five-hundred times in a row. UGH!! BUT-with the exception of word-count editing, I actually like it. I like getting re-immersed in the story and finding areas that I'm surprised I wrote. I like spending time with the characters without the pressure of writing the next chapter. So, it has it's ups and downs. But yeah–as far as I'm concerned, editing is the most important part of writing. Good one. I remember what my teacher once said. To be a good editor, you need to detach from the writing and view it in an unbiased manner. You are so right. Sometimes, I love to re read and work on it. Other days I am just so not up to it. But editing skills are as important as writing skills.